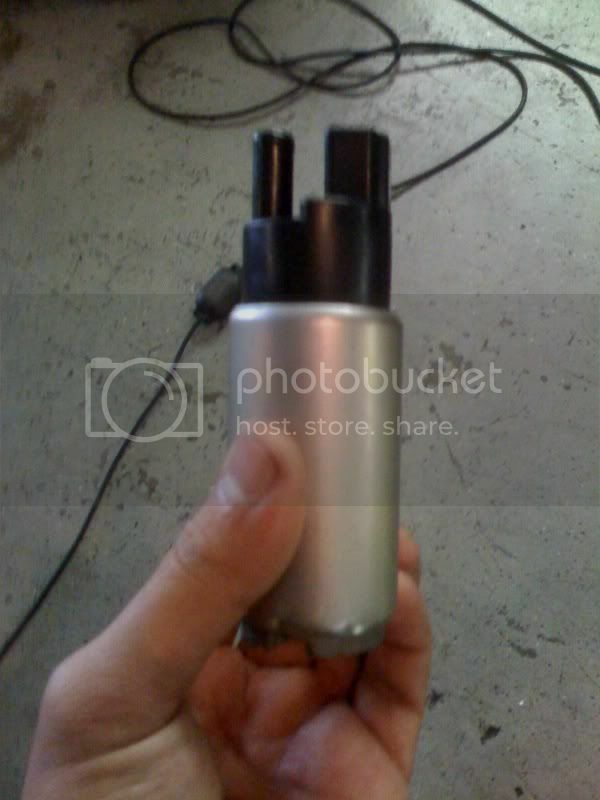 Heres a little DIY for people looking to install the walbro 255lph fuel pump for their scion tC’s…. Start off by taking off the back seat cushion, you need to access the fuel pump through the inside of the car, once the back seat cushion is removed you will see a disc plate w/a power line running into the middle…. For this part simply take a flat head screwdriver and begin to pry up the disc plate, its held down by a black sticky tak……don’t jump the gun and grab a blow torch here guys this is not the oil pan……it comes off quite easily. Place the screwdriver on the lower left side, it’s the best angle, pry up and itll come right off. Once everything has been disconnected, take the fuel line and ziptie it somewhere on your car w/ the line facing up so fuel does not shoot all over your car while you work on the pump. Lift up the pump gently and be careful not to break anything when taking out the housing. 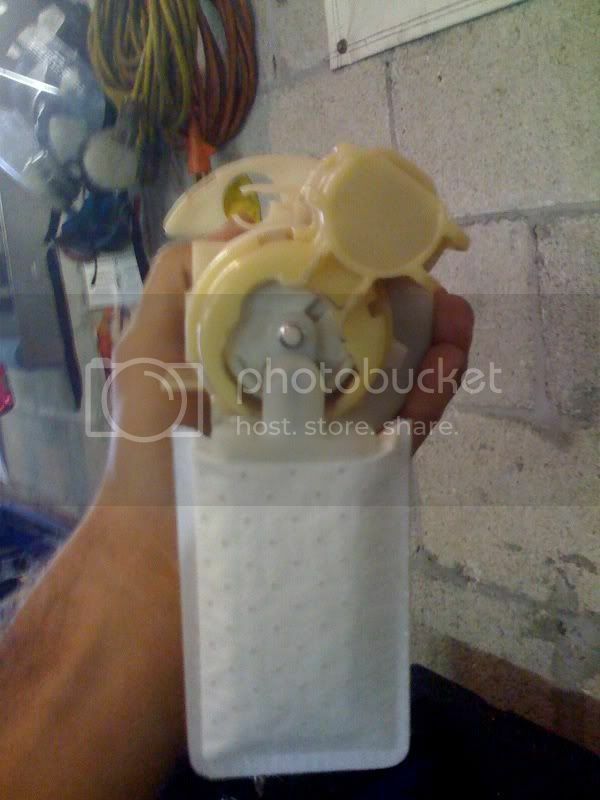 Once the entire housing has been removed from the car disconnect the top and bottom part of the housing, held in by clips, disconnect the power to the fuel pump and with a little push the fuel pump should pop right out. With the stock fuel pump in hand, remove the clip, rubber ring, and tip from the top of the fuel pump (side where fuel line / power). Loose the tip that was on the stock fuel pump you don’t need it, reposition the clip and rubber ring to the walbro fuel pump….clip goes first then o ring on top, just as it was on the oem fuel pump. 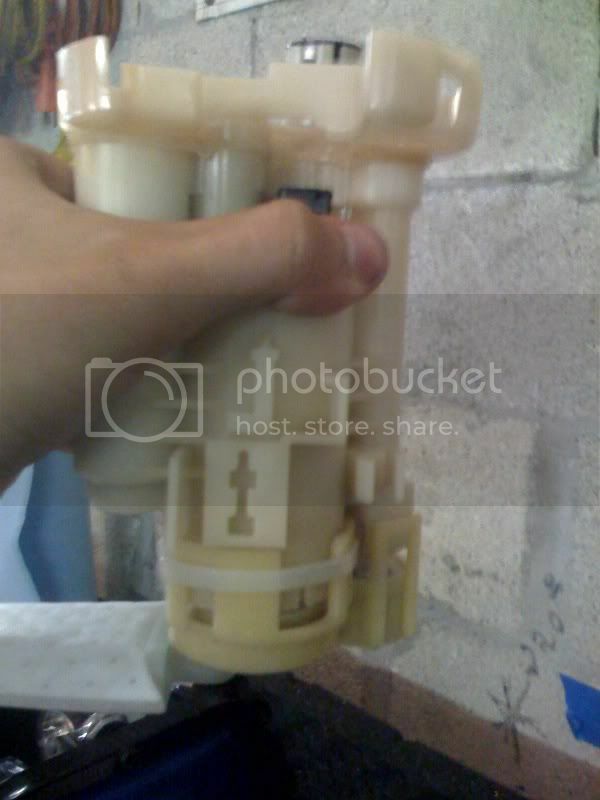 Here is the stock fuel pump with everything removed. Now cut the wires found in the top portion of the fuel pump housing and wire the new power chord. You get provided with the necessary wiring parts (mines from dezod, but if you get it from somewhere else I’m unsure if it comes w/ these parts) but I chose to solder mine here is a picture. Once you are finished with the wiring place the walbro back into the fuel pump housing, just as the stock one went in, be sure to have the proper fittings on the pump. 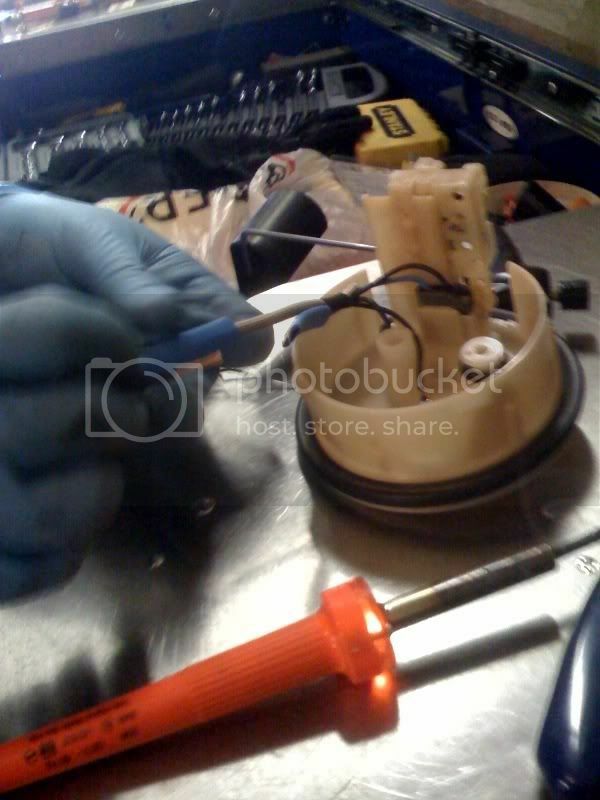 Plug in the newly wired power source, and assemble to top part of the fuel pump housing. Don’t forget to place the new fuel filter on the walbro. The tricky part, the bottom of the fuel pump housing. The fuel pump has a stock rubber bushing that is much smaller than the one found in the walbro, not only that the bottom half of the fuel pump housing will not clip back in place because of its longer size. What you do is dremel away an opening so the fuel pump can snap back into the housing. this gives you an idea as to how much you may have to cut. Just be careful not cut away too much, you need something to hold it in place. I chose not to use the rubber piece that came w/ the pump because it just made the pump harder to fit, you cut away the right amount that pump will go in there nice and snug. Since pieces of the housing were cut, and me being paranoid I decided to get a zip tie and fasten it around the outside of the housing surrounding the clips that snap the unit back into place. make sure all clips are attached and reinstall the fuel pump. btw im not sure but idk if that zip tie will hold up to gas....I would think that gas would melt plastic like that....could be wrong though. good write up. thanks for the info! I know this is probably just for turbo rides, but what does the fuel pump do again? so this wouldnt be pointless if I didnt have turbo? A fuel pump's function is to pump fuel. Got it? Useful enough? But yeah a simple explanation of upgrading a fuel pump especially on boosted engine is that it improves the quality spray of the injectors which will result in better burn.. Imagine you are trying to mix/push air and fuel into the cylinder, if you have way more air pressure (boost) than fuel pressure in the cylinder it will result on a bad quality spread (bad mixture) or using stock fuel pump on high boost will result to leaning out since the amount of boost pressure will suppress the fuel spray from making its way to the cylinder. Anyone know if the "install kit" that is listed with this product on Dezod site is something that Dezod does or it that something that comes with the Walbro pump? Ahh i c. thanks again for this info! How much louder is this pump over stock? and yeah id like to know if its any louder than stock and did it make your current set up run richer than before.......some have said that it may.